Known as theCutter Bladebecause of its superiority for dissolving resins. The E Blade or Type 3 dispersion blade utilized for high vehicle viscosities and/or solids loadings. 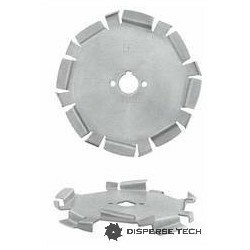 This dispersion blade produces shear but with more turbulence than other designs. Unlike most standard designs the teeth vary in size and angle. Diameter 2" 3" 4" 5" 6" 8" 10" 12" 14" 16" 18" 20" 22" 23" 24" 25" 26" 28" 30"
Hubs are only required when mounting to non-standard disperser or adding an additional blade mid shaft. Required when blade is too large to fit through manway or opening in tank. 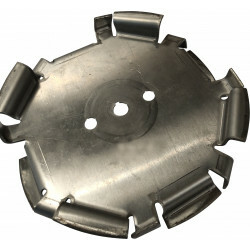 May be used to facilitate installation of mid shaft blade. *Complete Quote Now. Or access any time from Top Nav Bar. As with all our dispersing blades it can be bored to fit any of the popular high speed dispersers, including; Myers, Cowles, Hockmeyer, Schold, Shar, etc.